It's a cliché and groan-worthy pun, but I am completely hooked on crochet at the moment - you have probably noticed this already. Needless to say, when Joanne launched a new pattern as part of The Crochet Project a few days ago, I couldn't resist. The pattern is Contour Shawl and it's perfectly suited to a bank holiday weekend as it is a gentle relaxing project which can be worked on while chatting (or sipping a glass of something cold and bubbly!) as it doesn't require much concentration. This photo was taken 24 hours ago, and it's already almost finished as it's super-speedy. Keep an eye on Instagram for further progress pics. 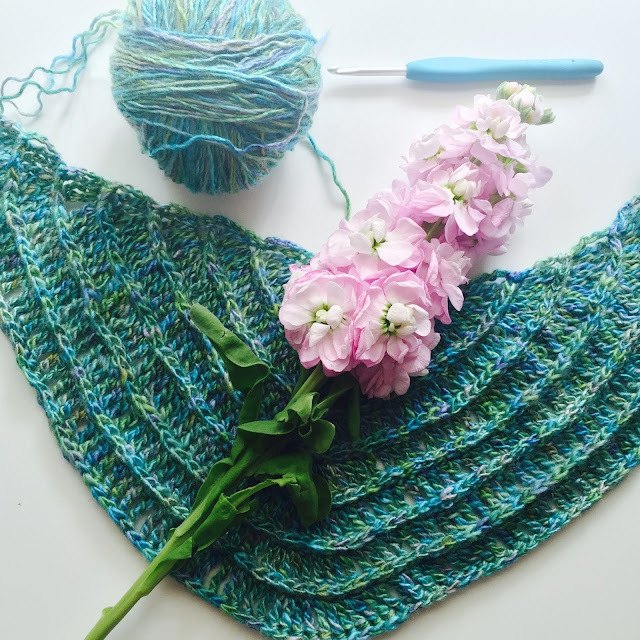 I'm pretty sure I'll be making more than one version of this shawl, as it will make a perfect travel project - an alternative to sock-knitting. There's some lace weight yarn in my stash that I'm eyeing up as I type. 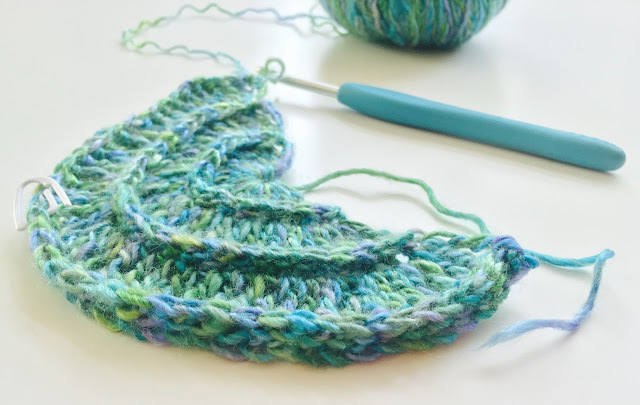 If you're a knitter who has yet to discover the love of crochet, there are some great beginner classes on Creativebug (affiliate), including Crochet Techniques for Knitters with Cal Patch. Use the link below to get a free trial of all Creativebug content (there are lots of kid-friendly crafts too, so it could turn out to be a half-term saviour!) - just remember that UK and US crochet terminology is different so you may need to use a conversion chart. In other (non-crochet) news, I have put the finishing touches to a new knitting pattern and it's out with test knitters this weekend. I can't wait to tell you more about it, but it's part of an exciting new product launch so I have to wait. I started out learning how to knit, but I lack the patience to be honest. And the 'threat' of dropping stitches is way too stressful to just sit back and relax, while I can actually do this when I crochet. My dad told me my gran was the same. So hey, my preference for crochet over knitting is genetic, nothing I can do! about it! oooh, i hadn't seen this pattern yet, but it is lovely... no surprise, as i'm a fan of everything by the Crochet Project. yours is in such pretty colors. and then what a surprise to see a shoutout to my class at the end! thanks for the mention my dear! You're welcome! I too love all the Crochet Project patterns - they always look great and are really well written/ easy to follow.